SAARC Chamber of Commerce and Industry (SAARC CCI) organised 5th SAARC Business Leaders Conclave with its theme “South Asian Century: Progressing towards Regional Integration” in collaboration with the Federation of Indian Chambers of Commerce & Industry and National Federations/ Chambers of SAARC member nations, In partnership with Friedrich Naumann Foundation (FNF) & The World Bank Group - as the knowledge Partner on 16-17th Jan 2014, in New Delhi, India. The Conclave aims at providing policy recommendations for the SAARC Summit scheduled in Nepal for promotion of economic activities in SAARC to policy makers at the highest level. The Conclave witnessed the congregation of large business delegations from Afghanistan Bangladesh, Bhutan, India, Maldives, Nepal, Pakistan and Sri Lanka. Over 500 leading business leaders and eminent International experts, Academia, Media and social scientists from across the region deliberated for two days on various pertinent issues of regional economic cooperation. Senior officials from Member States addressed the contemporary and emerging issues like repositioning of South Asia in Asian Century, regional integration, Energy, water and Climate Change, Trade Facilitation, trade and investment etc’. The Conclave organized specials sessions on Young Entrepreneurs in South Asia, while recommending the Governments of South Asia to provide business enabling environment to foster the process of regional integration. 1 We, at this 5th Conclave, representing the entire private sector through the National Federations of each 8 Countries unanimously adopt to emphasize on the Governments of the Member Countries to engage seriously on regional integration progress and to enhance its role in “Asian Century” and further request to take appropriate urgent measures to implement the action plan envisioned for deeper integration of South Asia. 6 We regard Energy, Water management , Climate Change and Food Security as major contemporary challenges, which need to be addressed through proactive and long-term measures at regional level. We urge upon the leaders of South Asia to adopt and implement Regional Environment Treaty; activation of SAARC Food Bank and SAARC Disaster Management centre to minimize the impact of natural calamities and climate changes. Formation of South Asian Integration and Promotional Agency, protecting/ promoting SAARC common Cultural Heritage. 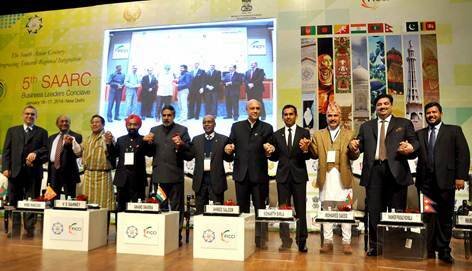 In order to deepen this process, the SAARC CCI will organize next SAARC Business Leaders Conclave in 2015. (Left to Right) Mr. Siegfried Herzog, Regional Director, Friedrich Naumann Foundation, Hon’ ble Tofail Ahmed , Minister, Ministry of Commerce, Bangladesh, Hon’ble Norbu Wangchuk, Minister of Economic Affairs, Bhutan, Mr. V. S. Sahney, President, SAARC CCI , Hon’ ble Mr Anand Sharma, Hon’ble Minister of Commerce and Industry, Government of India, H.E Mr Ahmed Saleem, Secretary General, SAARC, Mr. Sidharth Birla, President, FICCI, Hon’ble Mohamed Saeed, Minister for Economic Development, Maldives , Hon’ble Shanker Prasad Koirala, Minister for Commerce and Supplies, Nepal, Hon’ble Engr. Khurram Dastgir Khan, Federal Minister for Commerce and Textile, Pakistan, Hon’ble Abdul Rishad Bathiudeen, Minister of Industry and Commerce, Sri Lanka joining hand together on the occasion of declaration passed on 5th SAARC Business Leaders Conclave 2014 on January 17-18 at New Delhi, India.